The opportunity to participate in exclusive contests, lotteries, and more! PLUS many surprises throughout the year! 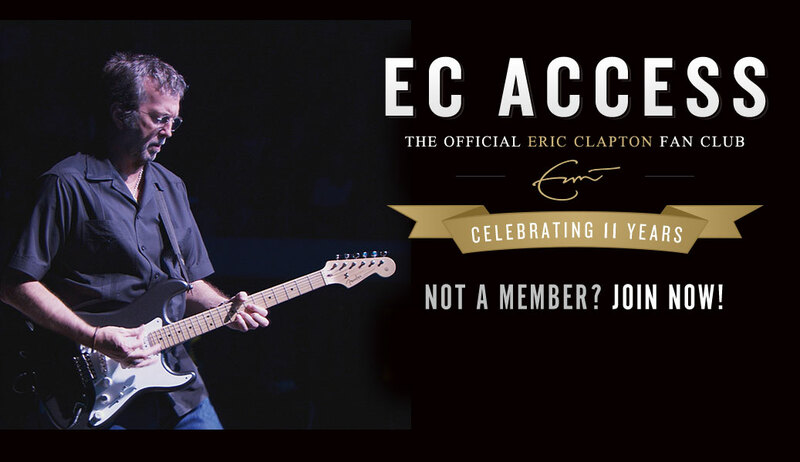 EC Access (www.ecaccess.cc) is the official online fan club and community for music legend Eric Clapton. As a member of EC Access you will have exclusive access to contests, special ticketing opportunities, events, polls, and the online community forum where you will be able to interact with other EC fans from around the world. An archive of videos, photos, and tour dates spanning the course of EC's career is available, as well as the opportunity to interact, comment on, and post your own images, videos, and memories to be shared with the rest of EC Access. HOW DO I JOIN EC ACCESS? In order to join EC Access, simply return to ECAccess.cc, where you will find two available membership packages. Click on the package you want and you will be taken through the registration process on our secure site, where you will create your unique username and password for EC Access *please note that usernames cannot be changed, once created*. Once your registration is complete and your payment is received, you will be sent an e-mail containing your redemption code applicable to your selected Membership Package. 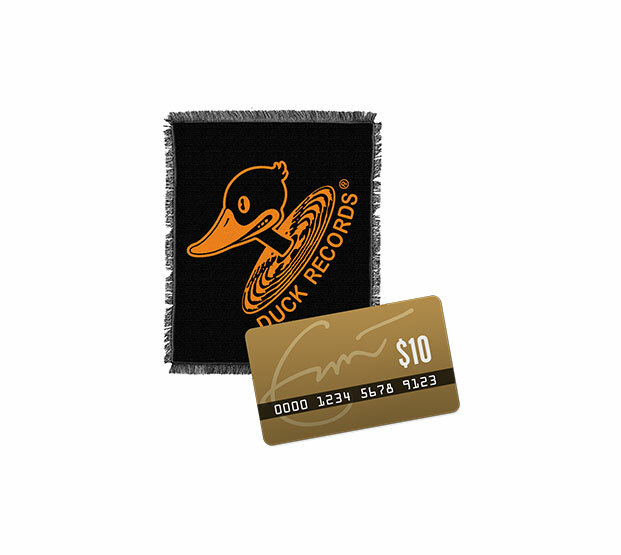 If you should choose to purchase the DELUXE package, the e-mail will also include additional instructions on how to redeem the merchandise items in your package. Input your shipping information so that we can then get the package to you. If you have any other questions, feel free to contact us at ecaccess@wbrsupport.com. 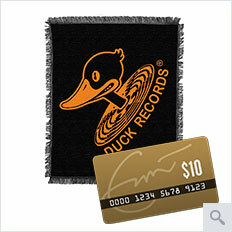 All EC Access members are entitled to 10% items purchased in the official online store at EricClapton.com. This code is always available to you in your EC Access Account. Sign in and click COMMUNITY in the NAVIGATION BAR along the top of the page. The 10% discount code (as well as all other codes that apply to your account) will be listed in the lower section of the right-hand column on the COMMUNITY page. The COMMUNITY page is where you will find listed the different promotion or discount codes associate with the purchase of your EC Access membership. 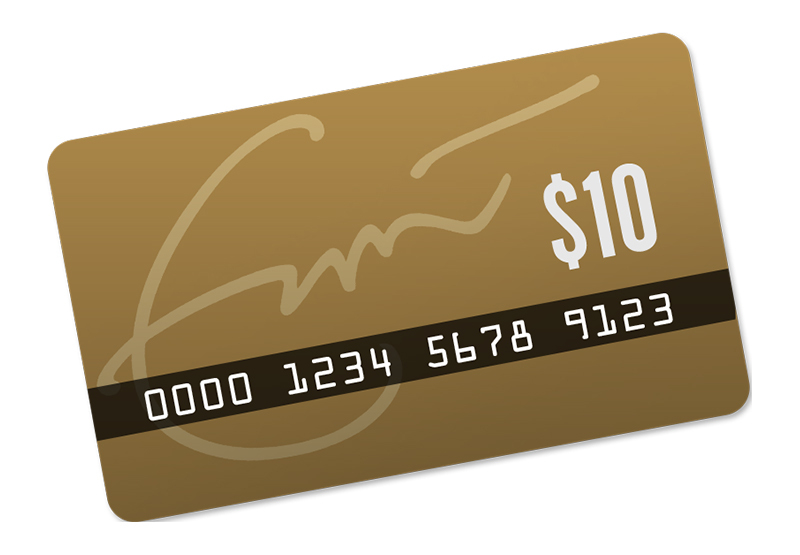 This is where ALL EC Access members will find their 10% official store coupon code, as well as others (applicable codes differ per membership package). These codes will be available to you at any time, while signed in to your account, and listed along the lower part of the right column of information on the COMMUNITY page. This tab is also your window into the worlds of your fellow EC Access members, and presents several opportunities for everyone to interact online. We strive to make special ticketing offers and seating arrangements available for EC Access Members whenever possible. Stay tuned to your member e-mails and the News section of the site for details on current or upcoming opportunities. EC Access Fan Support is available to assist with all things EC Access (the website, offers, and opportunities included therein). *While autographs and meet & greets may potentially be offered as part of opportunities made available through EC Access, we cannot provide them on an otherwise individual basis. If you are having trouble viewing the site or some of its elements, please first double-check the system requirements, listed elsewhere in this FAQ. If all of your software is up-to-date, please try clearing your web browser's cache of cookies/temporary internet files, closing the program, reopening it, and logging back into your account. If you continue to experience trouble with viewing the site or have any other questions not answered elsewhere in this FAQ, please feel free to contact ecaccess@wbrsupport.com. Shipments to addresses within the United States are sent by UPS or United States Postal Service First Class Mail depending on weight and usually take 7 to 10 business days to arrive. International shipments including Canada and Mexico are sent by United States Postal Service Economy and usually take up to 21 business days to arrive. International shipments may be held by your local Customs Authority for an additional 10 to 14 days depending upon the customs laws in your country. Therefore, it is best to allow for 4 to 5 weeks for delivery. A Note To Canadian And International Customers: If you order products for delivery to a shipping address outside The United States, you will be responsible for any and all import taxes, tariffs and duties which may be levied by your Customs or Government or Other Authority upon any parcel we send to you. *Please note that the purchase of an EC Access membership is non-refundable - all membership sales are final. 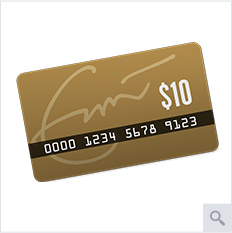 Once you have purchased your EC Access membership and have created your unique account and password, you may access your membership by visiting ECAccess.cc and logging in using the fields provided at the top, right of that first page. Enter the e-mail address that you used when creating your account (where you receive your EC Access e-mail updates), as well as your password in the appropriate fields, click "Sign In" and you will be taken to the FAN CLUB HOME PAGE. Once you have logged in to your EC Access member account, you can navigate the site using the NAVIGATION BAR, located at the top of every page in EC Access. Roll your cursor over any of the words in the NAVIGATION BAR, and you will see that they become highlighted. Each word is a link to that particular section of the site. Located on every page within EC Access, toward the top right of the page, you will find an USER NAVIGATION MENU with links to help you manage and update your personal EC Access Account. Here, you also have the option to LOGOUT of your EC Access account by simply clicking the "Logout" link in this area. Once you have clicked on one of the first five options, you will be taken to that section of the "MY ACCOUNT" page. Note also that once you have successfully navigated to the MY ACCOUNT page, you may use the "tabs" that appear in red, horizontally, above your account information, to navigate to the different sections. Clicking on VIEW MY PROFILE or selecting the VIEW tab from the options on the MY ACCOUNT page will show you the profile that you have created, as it appears to other members of EC Access. Clicking on EDIT MY PROFILE/ACCOUNT SETTINGS or selecting the EDIT tab from the options on the MY ACCOUNT page will open a form, allowing you edit your profile information. When adding information to your account profile with the EDIT feature, please feel free to include as much or as little information in the available fields as you would like. By no means is this information required for your EC Access membership, but is meant only as an opportunity to introduce yourself to other fans as you continue to become a part of this growing online community. -Under ACCOUNT you can make basic changes to your overall account. Here you can change your password by entering a new password in the fields provided and clicking SAVE at the bottom of the page. The next time you login, you will need to use this new password. You can change your friend notification settings here, as well as provide your longitude and latitude or City/State information (if you would like to) so as to be part of the LOCAL members search option in the COMMUNITY section of the site. The ACCOUNT view also includes an area to upload your PROFILE PICTURE, as well as edit your contact settings. -Under PROFILE you can add as much information as you like, in the fields provided, to share your EC and life experiences with other members of EC Access. Enter the information which you would like to publish into the available fields and be sure to click SAVE at the bottom of the page when you are done. This information can be edited at any time by simply returning to this area of the site. -Under PERSONAL you can add still more information about you. Information entered here as well as in other parts of your profile will be used to help other members find you using the member SEARCH feature in the COMMUNITY section. Clicking on MY FRIENDS or selecting the FRIENDS tab from the options on the MY ACCOUNT page will show you a convenient list of member names and profile pictures of other members that you have "friended" here on EC Access. Clicking on MY JOURNAL or selecting the BLOG tab from the options on the MY ACCOUNT page will pull up your personal EC Access Journal/Blog entries, beginning with the most recent. Click on the Subject/Headline for each entry to view it individually along with all posted comments, and be given the form to add a new comment. (POST NEW JOURNAL) / "Post a Blog"
Click (POST NEW JOURNAL), located next to MY JOURNAL in the USER NAVIGATION MENU, or the "Post a Blog" link under the tabs in the MY ACCOUNT window, to create and post your Journal entries. You will be presented with fields for the Subject and Body of your entry. Be sure to click SAVE when you are all done, though the PREVIEW option will show you what your post will look like once it is published. Click the MORE INFORMATION ABOUT FORMATTING OPTIONS link at the bottom of the Journal Entry page for a chart of technical, HTML code information which may help our technically adept members to be as visually creative as they like. Clicking on MY GALLERY or selecting the PHOTOS tab from the options on the MY ACCOUNT page will show you all the photos that you have uploaded to your account. Click on each photo to bring up all member comments and information related to that photo. (UPLOAD A PHOTO) / "Add a Photo"
Click (UPLOAD A PHOTO), located next to MY GALLERY in the USER NAVIGATION MENU, or the "Add a Photo" link under the tabs in the MY ACCOUNT window, and you will be taken to the form to upload a photo from your computer. TITLE the photo, then click the "BROWSE" button to locate the image file on your hard drive that you wish to upload. Fill out the other fields at your discretion - information that will appear along with your photo whenever it is viewed by a member of EC Access. You may also choose a pre-existing category, under which to file your photo in the MEDIA section, from the drop-down menu under the word "VOCABULARIES" on the upload form. The "ADD A MEMORY" option will take you to a page where you can enter date and details about your own memories of Eric Clapton, his music, and his performances, viewable under CONCERT MEMORIES in the COMMUNITY section. The "FIND MEMBERS" link will automatically take you to the COMMUNITY section SEARCH feature. For more information, please see the COMMUNITY section of this FAQ. Choose this option from the USER NAVIGATION MENU to renew your existing EC Access membership. You can renew your EC ACCESS membership at anytime. When you renew your membership, you will enjoy another full year of access to the exclusive online community of Eric Clapton fans from around the world. You will continue to enjoy new, exclusive videos, downloads, contests, photos, special opportunities to purchase tickets to select events when Eric tours, and much more! Choose from the listed Member Packages (same details as New Member packages) to begin the renewal/purchase process right here on EC Access. Immediately after logging in to your EC Access account, you will be taken to the FAN CLUB HOME PAGE. This page is an overview of recent activity and information about EC Access, featuring recent news items, links to current contests, interactive polls, links to recently uploaded photo, video, and tour content. The NEWS section of EC Access is where you will find posted the latest news items regarding EC and your EC Access membership. This is also where you’ll find any information regarding contests. You can navigate to older news posts by selecting the "page number" at the bottom of the light-grey field, or clicking the arrow-shaped links on either side. Also, you can easily share a news item of interest via other popular social networking sites DIGG and FACEBOOK. If you are already a member of one or more of these sites, simply click the appropriate icon located at the bottom right of each news post, in order to share! The TOUR section is divided into two categories - UPCOMING events, and our ARCHIVE of past events. Switch between these two categories by clicking on the words UPCOMING or ARCHIVE at the top of the light-grey field of tour information. You can navigate to older tour date posts (in either UPCOMING or ARCHIVE) by selecting the "page number" at the bottom of the light-grey field, or clicking the arrow-shaped links on either side. The TOUR page, in addition to the NEWS page, is a good place to look for information regarding any current or upcoming ticketing offers for EC Access members. Please have patience as we continue to populate our site with information from EC's myriad of past performances. As we input these dates, they are organized by year. Clicking on a particular year toward the top of the page will list the performance dates from that year. Click on the event date (or the "More Info" link) to view the full details and member comments, or to post your own comment, regarding the historic performances of your choice. The MEDIA section of EC Access is where you will find an archive of photos, videos, and downloads provided by EC Access, as well as media that you and other members of EC Access uploaded via the "My Gallery" feature on your account. Clicking on PHOTOS brings up another set of tabs to help you navigate our collection of still images: ALL PHOTOS - LIVE - EC ACCESS EVENTS - OTHER. Select from this list to narrow your search through the photos. Click directly on the image of your choice to see it full size along with all posted member comments. Click ADD COMMENT to post a response of your own. You will be taken to a page featuring the photo and blank boxes where you can enter your comment and save it to the photo. Clicking on VIDEOS brings up another set of tabs to help you navigate our collection of still images: EVERYTHING - MUSIC VIDEOS - LIVE PERFORMANCES - OTHER VIDEOS. Select from this list to narrow your search through the videos. Click directly on the video of your choice to see it play, as well as to review all posted member comments. Click ADD COMMENT to post a response of your own. You will be taken to the page featuring the video and will be provided blank boxes where you can enter your comment and save it to the video, for viewing by the rest of EC Access. Fan club members can create their own photo gallery and upload photos to the website. Check out all the member galleries listed in this section. They are organized by member (click the member name to view the profile of the posting member, click the "Photo Album" image to view their posted photos and related comments). Feel free to browse through the photo galleries and look for more new photos added to the site every day! Occasionally, fan photos (including yours!) may be used as the FEATURE FAN PHOTO which you see on all the pages of the site. For information on how to upload your own gallery of photos, please see the MY ACCOUNT section of this FAQ. To report inappropriate content, please contact: ECAccess@wbrsupport.com. This is where you can take part in or create ongoing discussions among EC Access members. Just click FORUM in the Navigational Bar. For more information, please see the FORUM section of this FAQ. You are welcome to publish and maintain your own online JOURNAL ( hosted here on EC Access, viewable to other members of the club. Selecting journals from the COMMUNITY navigation tabs will show recent journal posts by other members in the light-grey field toward the left of the page. Each post is abbreviated in this view for quick perusal, but you can view the entire post and all associated comments by clicking on its Headline. Click ADD COMMENT to view the entire entry, as well as to create and post your comment(s), viewable by the author and other EC Access members. You can also click the journal author's MEMBER NAME, linked in the by-line for each entry, to view that member's EC Access profile. Click the "(Member Name)'s Blog" link at the bottom of each entry to see all Journal Entries written by that particular member. A list of recent comments can also be found in a small box on the right-hand side of the COMMUNITY page. For more information on how to post your own JOURNAL entries, please see the MY ACCOUNT section of this FAQ. Click on the CONCERT MEMORIES tab on the COMMUNITY PAGE to browse notes and memories from EC Access members as they pertain to particular shows throughout EC's career. The posts are organized first by decade. Select the decade of your choice from the list that appears near the top of th active, light-grey field. Click on the headline or "Add New Comment" to view the complete post and be provided with the text boxes to enter your comment on the Memory. You can click the journal author's MEMBER NAME, linked in the by-line for each entry, to view that member's EC Access profile. Selecting the MEMBERS tab on the COMMUNITY page will allow you to browse the current members of EC Access. The first information that appears will be a Google Map, showing the location of members based on information provided in their profiles. Just below is a list of the NEWEST MEMBERS. Click on the member name or profile picture to view each Member's profile. At the bottom of the MEMBERS section, you will also see a list of current ONLINE MEMBERS - members currently signed in to their EC Access accounts. Click on SEE ALL MEMBERS below the list of NEWEST MEMBERS to browse all the member profiles available on EC Access. Use the numberic page number links / arrows at the bottom of the list to continue down the list. Click on the LOCAL tab in the COMMUNITY section to view members located near to you. In order for this to work, you must first enter your location information on the map in your profile. For more information on how to do this, please see the MY ACCOUNT section of this FAQ. As with all other sections of the site, once the list of local members has been generated, you may click on their member name or profile photo to view the associated profile(s). The SEARCH tab in the COMMUNITY section gives you the option to search for particular members or any members that meet your search criteria. Clicking SEARCH will open a new box or field in the right column of the page, allowing you to search by some or all of the criteria listed (as simple as Male/Female, or as specific as a particular e-mail address). Once you have entered your criteria, click SEARCH and the results will be presented as member names/photos in the box on the left. As with all other sections of the site, once the list of matching members has been generated, you may click on their member name or profile photo to view the associated profile(s).